green tea | Lagusta's Luscious! For posterity and record keeping, I’m making a blog post with each Chocolate of the Month as the month ends. Here’s March! March! It’s still pretty early for little green things to begin poking their way up out of the ground, but I’m so eager for spring that I decided to make a springy chocolate in March anyway. I wanted something to awaken the senses after what’s been a ludicrously wet and icy winter here in upstate New York. Mint is one of the first plants to come back to life in the garden, and it also really wakes up the taste buds, so I fiddled around with a few types of mint. I use chocolate mint in the Peppermint Patties, so I decided to use peppermint in this bonbon—it’s an entirely different flavor, more zesty and sharp than chocolate mint. I paired it with super high-quality matcha powdered green tea, for a light green color and a wake-up call of another sort. The pairing works really well—the top notes of bright mint and the earthiness and almost grassiness of the matcha, a pale green interior flecked with tea encased in a thin chocolate shell. (If you’re so inclined, it also works for St. Patrick’s Day!) And the English major in me is in love with the alliteration: mint, matcha, March! Mmmmm! But what’s also true is that a few weeks ago a long-time customer emailed me with the idea for this exact chocolate. I wrote back and said thanks for the idea, and I scribbled it down in my little ideas notebook (right next to “scallion ganache?? 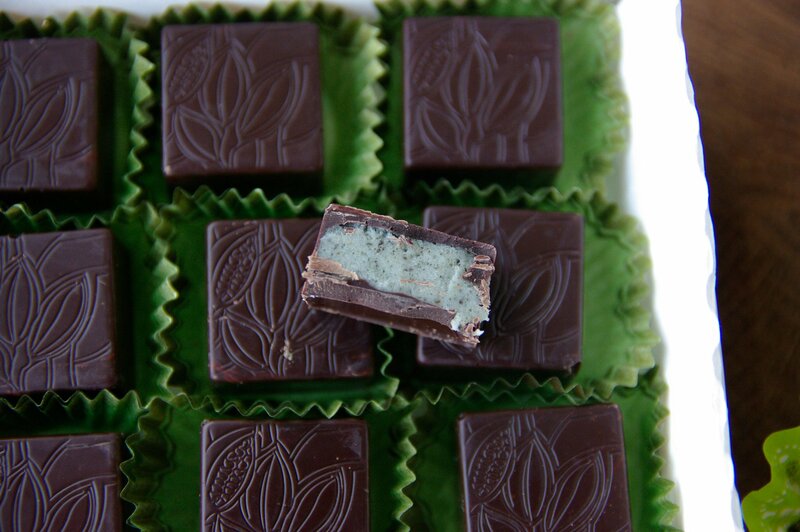 ?” — not so sure about that one…), and when it came time to test out March chocolates I made about six different things, including the mint/matcha mix, and offered them to friends to taste. It was the clear winner. (Someone is certainly getting a free thanks-for-the-idea box in the mail!). So, this chocolate is perfect for spring, and also celebrates how wonderful all you Bonbons lovers are. I hope you like it!